The satellite is called “Strand-1.” The project is headed by Surrey Space Center (SSC) and Surrey Satellite Technology Limited (SSTL) located in Guildford, England. The satellite is scheduled to be launched at the end of February from India and part of the spacecraft’s mission will be controlled by a Google Nexus One handset. The device is connected to the satellite’s systems via USB cable and has not been physically modified in any way. Obviously it has some rather customized software in it, but otherwise, “We haven’t gutted the Nexus. We’ve done lots and lots of tests on it; we’ve put our own software on it. But we’ve essentially got a regular phone, connected up the USB to it and put it in the satellite,” according to SSC’s lead engineer, Dr. Chris Bridges. The Nexus One will be placed along the side of the inside of the satellite where its 5MP camera will be able to take pictures through a window on the rectangular shaped spacecraft. 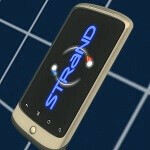 Strand is actually an acronym for Surrey Training Research and Nanosatellite Demonstration. That is right, “nanosatellite,” as this whole apparatus is only about 30cm long, and weighs about 4.3kg. Initially, the control of the mission will be handled through a Linux-based computer developed by SSC with the University of Surrey. The small craft will test a couple of propulsion systems, one involving a Water Alcohol Resisto-jet Propulsion De-orbit Re-entry Velocity Experiment (WARP DRiVE), the other involving small pulsed plasma thursters. If all goes well, the scientific team will begin turning control over the Nexus One where the mission will make history as the first phone to run a satellite in orbit. From there, it may begin running the “Scream in Space” app which will play videos of people screaming to test the notion, “in space, no one can hear you scream.” There is also an app to measure more practical information related to the magnetic environment. The satellite is scheduled to launch on February 25th. sorry ...com.Satellite is not responding ...force close ? wait? LOL. They can probably remotely control the phone.